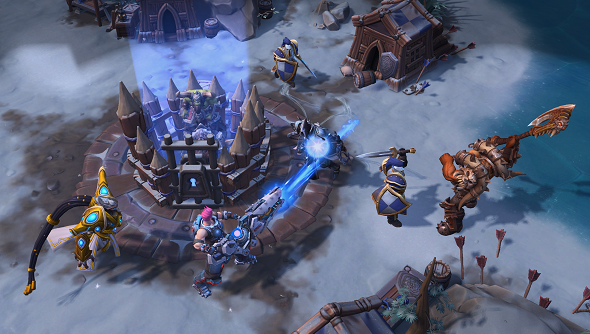 Alterac Pass is Heroes of the Storm’s new map. Blizzard fans will no doubt remember this iconic location from various titles in the Warcraft canon, including World of Warcraft. As the valley dividing the kingdom of Alterac from Arathor, this large, three-lane battleground will open up new opportunities for experienced and casual players alike. Unlike other battlegrounds, Alterac Pass does not feature a structural core outside The Hall of Storm. In its place stand the respective faction leaders for each side of Alterac’s bitter conflict – the Alliance and the Horde. The two sides must fight their way through traditional forts and keeps to reach the faction leader. Bring down this boss and your side wins the match. This may sound daunting, but remember – the bigger they are, the harder they fall. Looking for more tactical action? Check out our definitive best MOBAs. Adding some extra challenge to proceedings, the faction leaders will fight back, using whirlwind attacks to fend off attackers. If you retreat to regroup, the faction leader will do the same, regenerating their own health in the process. For every keep you manage to destroy, the enemy’s leader will suffer a loss in armour, like some kind of high-fantasy strip poker game. You should also watch out for prison camps that will spring up above, and below the middle lane of this battleground. Adding a little more tactical spice to the action, prisoners will periodically spawn within these capture cages. Lead an attack to free them to gain a significant tactical advantage. Once freed, your prisoners will spawn a cavalry unit on each lane. These units will push into enemy territory and support allies with a damage and speed boost aura. These boosting auras will increase in power for each objective you capture. In addition, you can find two Knoll siege camps and two ice giant boss camps on this map. Be wary of these fearsome foes as they have the ability to significantly weaken your attacking force. When traversing the environment, be mindful of mud pits as they will slow your movement speed and leave you vulnerable to an ambush. The best way to find success on this map seems to be freeing your cavalry and staging an all out assault on the enemy generals. A war of attrition is not an option on Alterac Pass due to their health regeneration abilities. So you’ll want to build up your forces and go for broke when the time is right. This new map arrives in the Nexus as part of the Echoes of Alterac update, which also sees the Draenei paladin Yrel join the game’s hero roster. The Echoes of Alterac will also give you the chance to grab some WoW-themed loot including skins, sprays, and mounts.